On May 22, 2013, the falcon eggs at Xcel Energy's Blackdog nest box began hatching. Immature female 16/U laid four eggs and hatched three. Although both parents diligently cared for their young, they never seemed to thrive. On May 27th, a watcher reporter strange black patches on one of the young. By May 31, two of the three young were dead. We don't know how the first one was disposed of, but the parents fed the second young to the third. In watching the box, we noticed the strange black patches. We also saw that the remaining baby didn't seem to be developing properly. It was quite small for ten days of age, spent more time under its mother than might be expected, and didn't seem to be developing feathers properly. Perhaps the young falcon had Frounce, a yeast infection of the digestive tract that interferes with food intake. We decided to go up the stack and treat it with Spartrix. This has been a very hard year on our falcons and we really didn't want to lose any more. I called Dan, our contact at the plant, and made the necessary arrangements. The Blackdog nest isn't especially easy to get to, since it is at the 600' level of the plant's smokestack. An elevator takes you to the 300' level and ladders take you the rest of the way. All told, you need to plan on a minimum of 50 minutes to visit the box. A big thanks to Dan for taking the time out of his day! I was really shocked when we finally got to the nest. The falcon was very small, coated with black gunk, and swarming with parasites. They were on its back, belly, under wings, and neck. 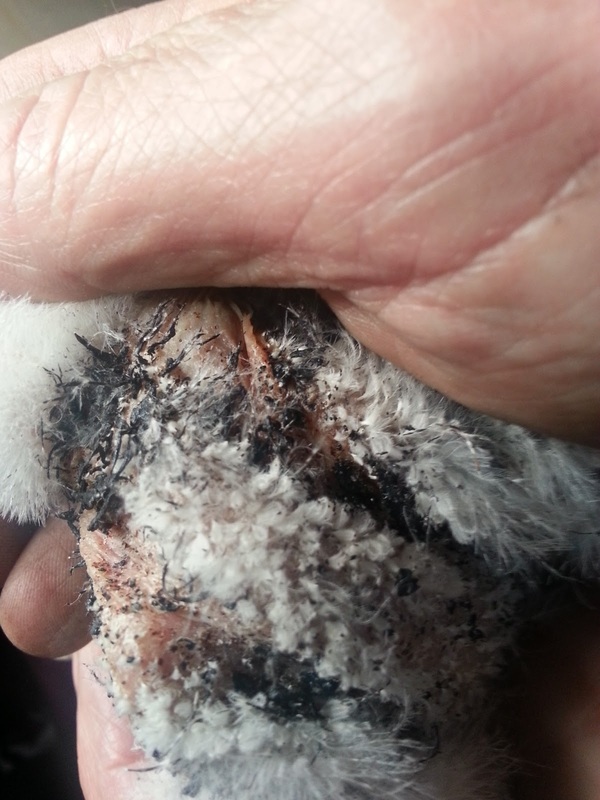 We thought the black gunk might be prey remains, but it was actually scabs, dried blood, and damaged feathers. The parasites, probably Amblycera or Hippoboscidae, were feeding by chewing soft areas of skin, causing an area of localized bleeding from which they drank. I decided to give the young falcon Spartrix just in case (Frounce could easily kill a falcon this stressed), and then Dan held the falcon while I carefully cleaned it off. This is a closeup of the falcon's back and neck. The parasites caused extensive damage, destroying feathers, interfering with feather growth, and delaying development. I killed and swabbed and crushed and killed and swabbed and crushed again. Once the parasites seemed to be (mostly) dead, I checked the box for anything that might be harboring more, took a few bits out, and returned the baby falcon, along with a dead quail. Mom was back in the box before we were back in the stack, and the quail was gone by the time we reached the bottom. Despite the damage, the young falcon had a good crop and even seemed somewhat feisty, weakly footing with tiny talons. While I don't know that the falcon will survive, we increased its chances of survival. The parents have been very busy preening the young falcon, sometimes what seemed (to human watchers) rather roughly. We now know that they were trying to remove parasites. But where did the parasites come from? Since lice are transmitted by direct contact, I'm guessing that the lice were brought in on a prey item. According to Science Direct: "With no wings and very small eyes, chewing lice are, by and large, helpless away from their host." However, they were presumably able to hop, skittle, or jump from prey on to the young birds, who lack the armoring feathers of adults and weren't yet preening themselves. We'll be watching this box closely over the next couple of days to see what happens to the young bird.